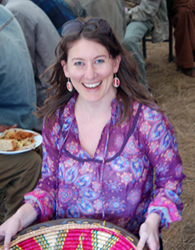 In March of 2011, local Habitat supporter Colleen Kaleda embarked on her seventh Global Village trip, her fifth as a team leader, with a group of 13 volunteers to the village of Debre Birhan, in Ethiopia. After seeing the need for decent, affordable housing all over the world through her service trips, she knew that the new Habitat village of over 500 homes would help change the lives for thousands of people. But what she didn’t know is that she would be moved to action in other ways, too. As the group began discussing the possibility of organizing this project, they soon realized that the need for infrastructure in this community went beyond just a school — and thus the The Community Project: Ethiopia was born. The CPE would include a community center to house various classes for adults, special meetings and a safe place for children to play inside when it rains, and a community garden where residents will learn about growing their own healthy foods, supplying the community with fresh produce for years to come. So Colleen went to work, sharing her Global Village’s team’s idea to build a community school that would serve all grade levels and provide children with solid educational opportunities. 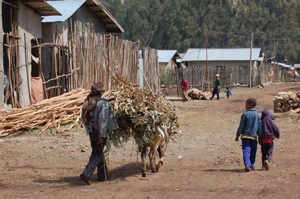 “The Community Project: Ethiopia just made sense,” said Colleen. “It will be an exciting community hub that will be based on input from the local residents and their needs. The community will help build the structures and manage the community center and garden. 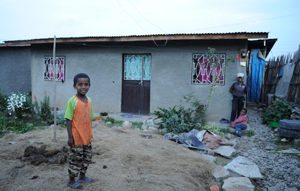 Habitat for Humanity Ethiopia has never launched a project like this before and the affiliate is excited to see how it impacts the Debre Birhan community. And Habitat for Humanity Portland/Metro East is excited and proud to tithe 5% of undesignated contributions to the Ethiopia affiliate as part of our affiliation with HFHI, supporting the very important work of Habitat for Humanity Ethiopia. Colleen and a few members of her team are currently raising funds to make the Ethiopia Community Project a reality. Donations of all sizes are currently being matched. To learn more about this project and what you can do to get involved visit communityproject.org.